Donald Czyzyk was driving to work at Happy Tails Humane Society in Illinois last week when he spotted something strange. 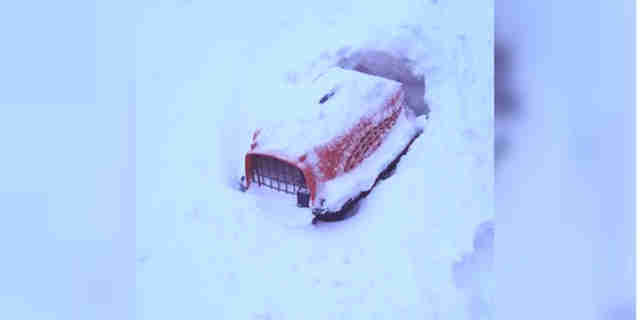 Near the entrance to the driveway, there was a plastic pet carrier half-buried in the snow. It looked to be completely packed with ice, likely from having snow tossed onto it by a passing plow. But then Czyzyk got closer — and saw an ear. There was an animal inside, almost completely buried in the snow. 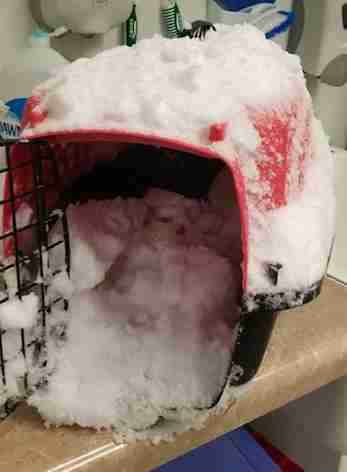 Czyzyk, who is the rescue’s veterinary assistant, instantly rushed over and started digging the carrier out, worried that whoever was inside had either been frozen or suffocated by the heavy snow. Once he freed the carrier, he ran inside and began desperately scooping out more of the snow. And then he finally saw her: A small grey cat emerged from the carrier, dripping with chunks of snow and ice. It’s not clear how long the cat had been out there — but she is so lucky that the carrier was still visible from the road by the time Czyzyk drove by. After her miraculous survival, the rescue team decided to name the cat Winter. Since she is about 1 year old and in good health, Winter was able to find a home right away with a local family. She’ll be going home this weekend. For now, Winter is warm, well-fed and comfortable — and will never have to worry again about whether she’s loved. While there are no leads so far into who abandoned Winter, the rescue is offering a reward for anyone who comes forward with pertinent details about the case. In the meantime, Czyzyk and the team are so glad Winter’s getting the happy ending she deserves — and that she’ll never be abandoned again. “She is going to a home with a very nice married couple and one dog, who the shelter has personally known for many years,” he said. If you ever see a pet left out in the cold like Winter was, here’s what you should do. To help more animals in need, you can make a donation to Happy Tails Humane Society.